Our Grade 70 chain binders have working load limit from 4,700 lbs to 11,300 lbs. Note that transport chain cannot be used for overhead lifting. We offer a wide range of Grade 70 chain, load binders, chain binder, coil racks and steel corner protectors and coil cuffs that best fit your requirement. Grade 70 transportation chain with grab hooks on each end. Note: Ratings governed by the National Association of Chain Manufacturers (NACM). • Chain Size (In.) - Grade 70 : 5/16" or 3/8"
It becomes necessary to use grade 70 chains binders when transporting heavy to very heavy duty loads like Coils, heavy machinery, tractors, etc. ; these loads need special chain binder.Grade 70 Chain Binders bring tension necessary for holding load in place. Drivers should know and understand their preferred type of load binders for use with different types of loads. 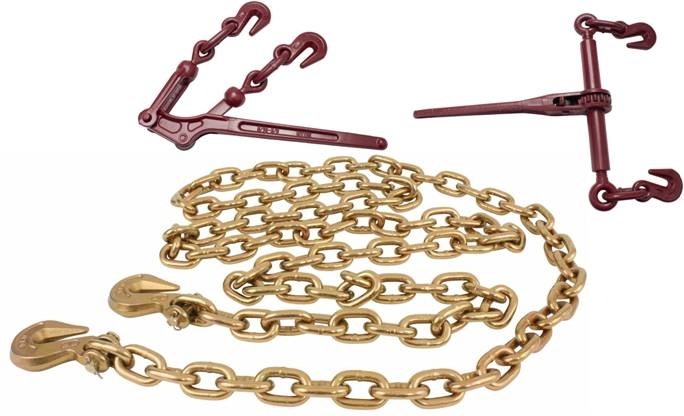 At Mytee Products, we carry Ratchet Style and Lever Style of Grade 70 Chain binders.